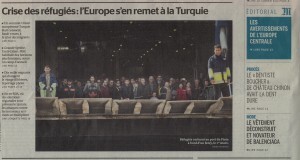 There’s a startling gap between the English and French media on the agreement yesterday (8 March 2016) on migrants from Turkey which has worrying implications for the EU referendum debate. In the afternoon I spoke with two friends who are usually well-informed, and who expressed concern at the deal being done with Turkey over migrants. My mind went into “euromyths” mode, wondering what the kernel(s) of truth in the story might be. Later caught a radio news bulletin which seemed to confirm what they had said — that a deal was being done with Turkey that would mean Syrian migrants reaching Greece from there would be returned, and one migrant from the refugee camps would be allowed to settle in the EU for each migrant returned. That’s an elegant way of removing the incentive for the human trafficers who are putting lives at risk. The implication is that this was a last-ditch attempt to head off Syrian migrants on their way to the UK, and linked to the sweetener of fast tracking Turkey’s application to join the EU (ignoring concerns at press freedom and democracy in Turkey). As with most Euromyths, there are some credible fragments, but also a suspicion that some of the dots are missing, so the obvious way to join them is not the wise way. A look at a little later Le Monde told a rather different story. The idea of returning people to Turkey makes the front page, with side stories about that, the situation in Calais, the situation in Greece, and fear of immigration having an effect on the forthcoming elections in Saxony. Each of these becomes a one-page story inside. The situation in Calais is described in grim terms with horror that, Medécins sans Frontières, used to dealing with humanitarian crises worldwide, is working in the camp. The headline about Greece describes those who have arrived from Turkey as “parias”, with photos painting grim picture of refugees in severe difficulty in a country already suffering economically, and now being impossibly strained to cope with being on Europe’s front line in an ongoing humanitarian crisis. Under a headline about Europe making is bunkerisation official there is concern at migrants from Syria heading to Germany and to Scandanavia (the UK is not the prime destination). It talks of European leaders struggling to stem the 15,000–20,000 people arriving each week. It talks of co-operation between the EU and Turkey, but, far from implying that concerns about press freedom are being ignored, specifically quotes Donald Tusk as pressing Turkey’s president Recep Tayyip Erdogan over press freedom, especially in relation to the publication Zaman. A measure of the desperation of the situation is that Human Rights Watch has flagged up the possibility of the proposed arrangements breaking international law as Turkey may not be a safe place to return some of these migrants to. And for Turkey’s “fast-tracked” accession to the EU, which is currently stalled, the suggestion is that collaboration over this might let that become unstalled. In the middle of this, Donald Tusk’s intervention over press freedom in Turkey sounds rather more as if the message is that there can be progress on Turkey’s accession, provided it is accompanied by improvements in press freedom. That in turn sounds like an attempt to push Turkey in a properly-democratic direction. The gap between the British and the French versions of the story is scary. One sees Europe working together to face a common problem caused by the civil war in Syria, and doing that by addressing the issue of migrants and the potential for Turkey to be de-stabilised. The British version sounds as if the UK alone is facing a migrant crisis, and in immediate danger of being overwhelmed by Turkey. Donald Tusk is right to push Turkey to have the press freedoms we are used to. But the gap between the reporting is serious with a referendum on EU membership in sight. The story is being reported in ways which invite opposite conclusions. My money is on Le Monde having got it right — not least because of the detail of its articles. But we have a big problem when British media manage to turn “working with our EU partners to address a shared problem” into something negative. With our media getting things this distorted, how can we have a well-informed referendum?